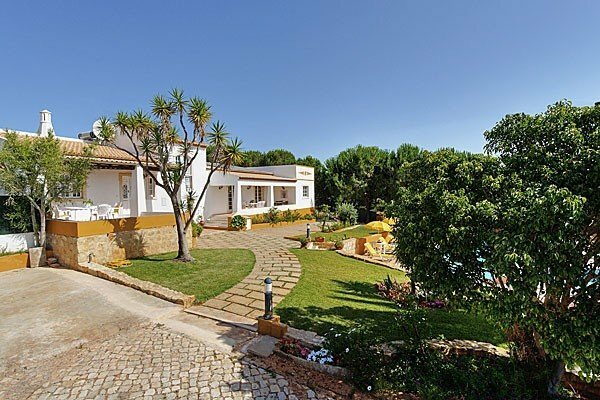 Monte Branco is located in Albufeira, Algarve. This detached vacation rental property sleeps up to 10 people with 5 bedrooms, 4 bathrooms along with private swimming pool. On the ground floor is a kitchen, dining area, lounge and 4 bedrooms (1 double with en suite and 3 twin), shower room and bathroom with bath.On the first floor is a double bedroom and bathroom with bath and overhead shower. The pool is surrounded by a paved, garden area and features an outside dining area, sun loungers, parasols and barbecue. The villa also features a smaller children's pool and open poolside shower.